There are numerous kinds of cheese, but Mozzarella is one of the most popular. This Italian cheese plays a significant role in Italian cuisine, and owing to its fame; it is now available throughout the world. However, is this famous cheese actually healthy? This article takes an in-depth look at the nutrition properties and potential health benefits of Mozzarella cheese. Mozzarella is a soft and mild-tasting fresh cheese that originated in Italy. However, at the current time, Mozzarella production happens all around the world. Buffalo milk is used to make authentic, traditional Italian Mozzarella, but many producers in different countries now use regular cow’s milk. The cheese itself comes in the form of round-shaped, white curds that are easy to slice. Additionally, Mozzarella comes in pre-shredded (grated) form, which many people prefer for convenience (and the lower price). Unlike aged cheese, it is straightforward to make Mozzarella. In fact, it is possible to quickly make Mozzarella at home in less than a day. Mozzarella has a mild flavor that works well in a variety of dishes. In contrast to sharp, tangy cheese like Cheddar and Parmesan, it suits a wide variety of dishes. The flavor is very light and does not dominate. Regarding the texture, Mozzarella is soft and moist, and it tastes slightly milky and acidic due to its citric acid content. Overall, it is very easy to eat, and it does not become “too cheesy” like stronger types of cheese can in larger amounts. 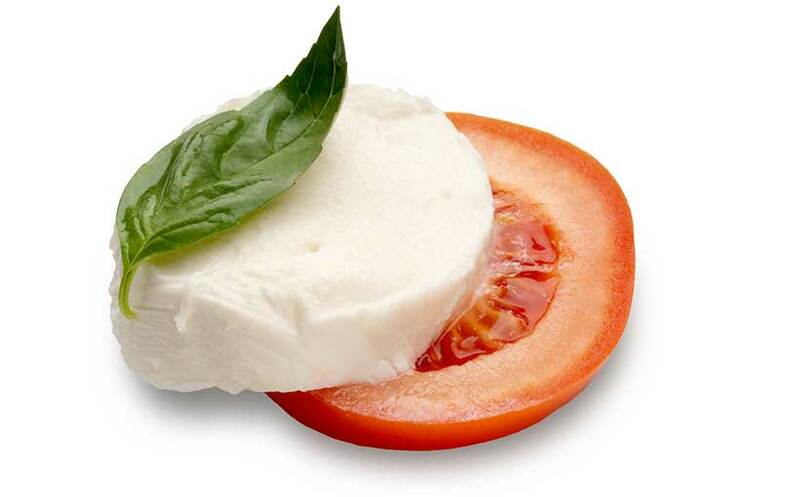 Key Point: Mozzarella is a fresh Italian cheese with a soft, mild texture. A wide variety of hot and cold dishes around the world make use of it. The tables below show the nutritional values for Mozzarella per 100 grams (1). As shown in the table, Mozzarella is lower in calories and fat than hard types of cheese like Cheddar. Like all cheese, Mozzarella is low in carbohydrate and only contains around two grams of carbs per 100g. This cheese also supplies a decent amount of protein, containing more than 22 grams per 100g. Similar to dairy foods in general, the majority of the fat in Mozzarella is saturated fat. As we can see from the data, Mozzarella provides an excellent source of vitamin B12 and low to moderate amounts of other vitamins. In addition to the vitamins in the table, Mozzarella also contains vitamin D.
However; there is no set amount for this because it very much depends on the type of milk used and how long the cows it came from could spend grazing outdoors. That being said, the amounts of vitamin D available in milk and cheese are generally low compared to other food sources such as oily fish (2). Lastly, Mozzarella also provides a small source of dietary choline (15.4 mg per 100g). Calcium is the major mineral in Mozzarella, with the cheese containing more than 50% of the DV per 100 grams. Other minerals of note include phosphorus, sodium, selenium, and zinc. Key Point: Mozzarella offers a decent nutritional profile with particularly high amounts of protein, calcium, phosphorus, and vitamin B12. Owing to its nutritional value, Mozzarella cheese offers several benefits for our health. While the amount of calories in food is not indicative of how healthy (or not) that food is, lower calorie foods can sometimes be helpful. For example, Mozzarella contains 300 calories per 100 grams while Cheddar—a hard cheese—contains 400 calories (3). In other words, Cheddar contains 33% more energy per 100 grams. For someone who is trying to lose weight who also eats a lot of cheese, opting for Mozzarella rather than a hard aged cheese can help to reduce overall energy intake. Furthermore, there is also a part-skim milk Mozzarella available that only provides about 254 calories per 100 grams (4). Key Point: Mozzarella is very low in calories compared to most other cheese varieties. Mozzarella is a calcium-rich food, and it provides even more of this mineral than other soft/fresh types of cheese. While Mozzarella provides 51% of the daily value per 100 grams, other varieties of soft cheese like Brie and Camembert contain 18% and 39% respectively (4, 5). Per ounce (28g) serving of Mozzarella, this works out at around 14% of the daily calcium value, which is a reasonable amount for such a small serving. Calcium is an essential mineral, and a sufficient intake is vital for maintaining healthy bones and teeth. Additionally, calcium plays a role in cell signaling, and it is involved in numerous functions such as cell growth, fertilization, and muscle contraction (6, 7, 8). Key Point: Mozzarella provides more than half the daily recommended value for calcium per 100 grams. Conjugated linoleic acid is a naturally-occurring form of trans fat that occurs in food from ruminants (animals raised on grass). Firstly, it is important to note that CLA has a very different effect compared to artificial trans fats. Although human-made trans fats cause harm, researchers believe that CLA offers health benefits. For instance, clinical trials suggest that CLA may help to inhibit oxidative stress, and it may also upregulate the body’s immune function (9, 10). Mozzarella cheese is one of the richest food sources of CLA, and it provides a higher amount per gram than most forms of dairy and meat. As shown, only lamb and butter contain more from this list. However, considering that the serving size of butter would usually be small, Mozzarella is probably the better source. Key Point: Mozzarella is one of the best dietary sources of CLA. Not many foods compare to meat for protein density, but Mozzarella is a reasonably protein-dense food. This fact is particularly true for the lower fat version of the cheese, which provides 24.3 grams of protein and 254 calories per 100 grams (12). Regular (and tastier) Mozzarella is not far away from this figure, and it contains 22.2 grams of protein per 100 grams (300 calories) (1). Notably, these protein concentrations are competitive with the protein density that red meat such as beef and lamb offer. Key Point: Mozzarella is an excellent source of complete protein. With this in mind, how do the two different types compare nutritionally? Fresh Mozzarella has the advantage when it comes to flavor and overall taste, but some people prefer the convenience of using pre-shredded cheese. Shredded cheese also tends to be cheaper than fresh cheese, which is one of the reasons why it is so popular. Generally speaking, fresh Mozzarella should only contain milk, salt, rennet, and citric acid. However, shredded Mozzarella often contains additional ingredients to help prevent caking (the cheese sticking together). The most common additional ingredients for this purpose are cellulose and potato starch, which are known as “anti-clumping agents”. Although many people understandably have a problem with the idea of eating “wood shavings” (cellulose), that isn’t quite the full story. For one thing, cellulose may be made from wood, but it can also be produced from fruit and several other foods. Overall, cellulose as a food additive is just a type of fiber, and there is no evidence that it can cause harm (13). 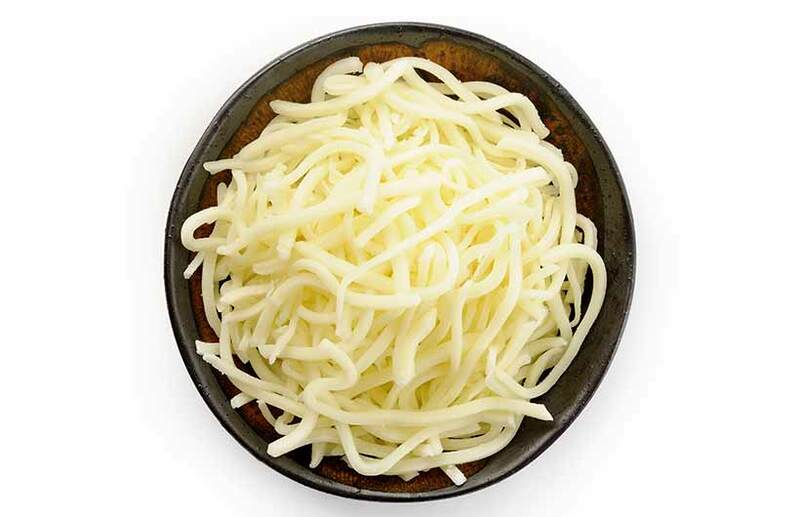 A further ingredient that may be present in shredded Mozzarella is natamycin, a preservative produced from soil bacteria that has anti-fungal properties. It is worth noting that healthy eating megastore Whole Foods considers natamycin to be an “unacceptable ingredient for food“. That said, a wide range of studies have examined the health effects of natamycin and found no cause for concern. The (notoriously strict) European Food Safety Authority also consider levels of natamycin used in food to be “not of safety concern” (14). Lastly, these additional ingredients are only present in small concentrations, and they contribute little more than 2% of the whole ingredients profile. Nutritionally, each type of Mozzarella is almost the same. The only (minor) difference is that shredded cheese will contain slightly fewer nutrients and minerals since it is not 100% cheese. Given a choice between fresh and shredded Mozzarella, I would personally choose fresh. The simple reason is that it is fresher, tastes better, and it doesn’t have the unnecessary additional ingredients. However, there is a lot of non-scientific scaremongering about shredded cheese, which is a perfectly fine option if someone prefers the convenience (and price point) it offers. In other words; the best choice is simply the one that you prefer. Key Point: Both fresh and shredded Mozzarella are good options. Mozzarella is a light, mild type of cheese that offers a decent nutritional profile and a great taste. Whether using it fresh in a salad or melted into a hot dish, it has an impressive flavor-enhancing effect on many different foods. Overall, Mozzarella is an adaptable dairy food that is both healthy and delicious. For more on cheese, see this article on why ricotta is so good for you. If you are taking statins for high cholesterol, should you avoid mozzarella cheese? I can’t advise on a personal medical issue I’m afraid. However, it may be something worth speaking to your doctor/nutritionist about. Is low moisture-part skim milk mozzarella a diabetic friendly food? Sugar content is basically nil- but just curious. Since the carbohydrate content is almost zero, lowering the dietary fat doesn’t really have an effect on the glycemic response. It just means it’s a more protein-dense option really. It certainly shouldn’t spike blood glucose levels if that’s what you are wondering. Why some mozzarella cheese contain sodium as high as 170 ? Sodium levels will depend on the particular manufacturer’s recipe. Sometimes they don’t list the sodium content, how do you know which one is the lowest sodium content? The amounts listed in this article are the general average (according to the USDA’s Food Database), but the only real way to know for sure is to check the label I’m afraid.